We developed a web-based model (STEPL WEB) with an updated approach to more closely follow the SCS-CN formula to estimate annual direct runoff. Moreover, this model is integrated with the Purdue Web-based Load Duration Curve Tool which identifies least cost BMPs for each landuse and optimizes BMP selection to identify the most cost-effective BMP implementations. The integrated tools provide an easy-to-use approach to performing TMDL analysis and identifying cost effective approaches to controlling nonpoint source pollution. How does this model work? STEPL WEB computes annual direct runoff using the SCS-CN method, annual contribution to shallow groundwater by soil infiltration fractions for precipitation, and annual pollutant loads by pollutant coefficients multiplied by annual direct runoff and groundwater. 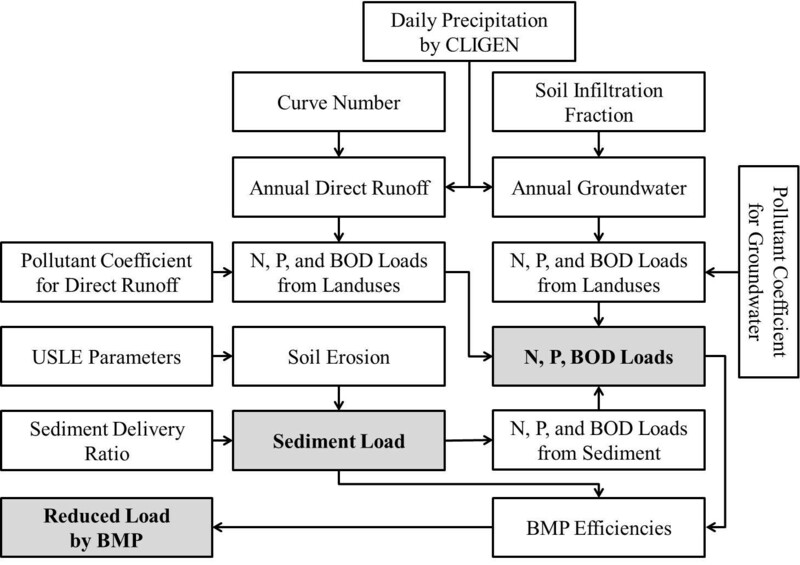 Sediment load is computed based on the Universal Soil Loss Equation (USLE) and sediment delivery ratio. STEPL WEB has two sources of nutrient loads (N, P, and BOD). The first source is the nutrient loads from landuses, which are computed by pollutant coefficients and annual direct runoff and shallow groundwater contribution. The second source is nutrient loads in sediment, which are computed by soil nutrient concentrations and sediment load. These sediment sources are important in high flow regime BMPs. Purdue Web STEPL’s is a web-based model capable of simulating pollutant load reductions for BMPs. Copyright © 2015, Purdue University and Kangwon National University, all rights reserved. Contact Dr. Bernie Engel or Larry Theller for more details if you need any help with STEPL WEB. This implementation of the classic EPA model was designed by Dr. Youn Shik Park, Assistant Professor, Kongju National University, South-Korea. Programmatic support from US EPA, Illinois-Indiana Sea Grant, and US Army Corp of Engineers.